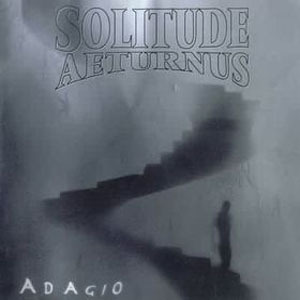 Adagio is the 5th album by American doom metal outfit Solitude Aeturnus. It stands firmly on the lighter side of the doom metal spectrum with tempos going from moderately paced (for a metal band) to the slower paces more commonly identified with the doom metal sound. Adagio starts out with the moody dark ambient introduction of My Endtime before Days of Prayer comes into get the album moving. It sounds promising enough but the 2 follow up songs, Believe and Never, are cut from the same cloth and fail to move Adagio forward. This is the major pitfall that the band faces and it becomes evident that Solitude Aeturnus don’t know which direction to take their songs despite having some good verses littered throughout the album. Solitude Aeturnus kick it up a notch for Idis and Empty Faith with more tempo shifts, a mix of clean and distorted guitar tones and singer Rob Lowe (whose voice suits this brand of doom and gloom particularly well) alternates between almost whispered lines and his powerful singing voice. The Fall gives some relief from the rehashed song structure by being a short and straightforward acoustic song before they quickly revert back to doom metal with the appropriately titled Lament. A cover of Heaven and Hell by Black Sabbath is used as the closer for Adagio. This forces them to adjust their approach and sees them steering away from familiar territory to bring much needed change to the album that lets it finish on a high note.